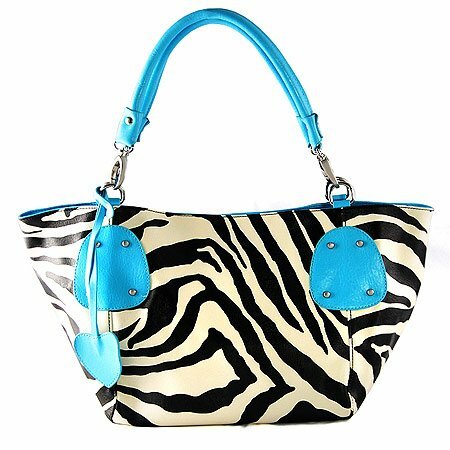 Stylish and stunning, this Zebra printed faux leather handbag is all you need to add to your attire. The improved design and the contrast touch of the trim and handles makes it stand out from the others. The dual handle and magnetic snap buttons makes it all the more easier for you to carry. The bag gives you a larger and defined area for your stuff making it look subtle in a smart yet simple manner. This bag is not only good for personal use but a great gift for your dear ones. 3 Magnetic Snap Button Closure with a tiny top zip and backside exterior zip featuring durable, smooth-gliding and easy-to-pull metal zipper. Main center zippered compartment capable of storing all essential accessories like cosmetics, sunglasses, with one wall zippered pocket inside, one slip pocket and one cell phone pouch. Matching color handles and trim with Silver Tone Hardware – Chrome Side Rings attached on the edge of the handles for sturdiness. Dual carrying leather handles for comfortable wear.